Сейчас Вы просматриваете программу, находящуюся в категории(ях): Мультимедиа софт / Редакторы аудио. Далее Вы сможете посмотреть полную новость программы, которой Вы заинтересовались. 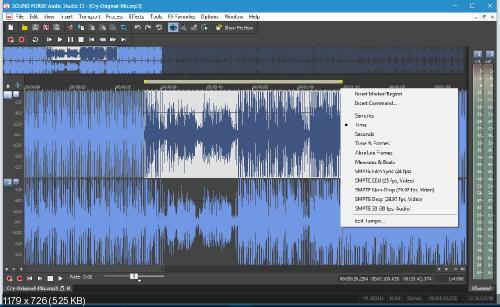 Для того, чтобы бесплатно скачать MAGIX SOUND FORGE Audio Studio 13.0.0.45, прокрутите страницу вниз до окончания полной новости и перейдите по указанным ссылкам. Приятного Вам скачивания! MAGIX Sound Forge MAGIX Sound Forge Audio Studio - мощный звуковой редактор, содержит все необходимое для записи, кодирования, редактирования и восстановления аудио на ПК. С помощью этой программы вы сможете наложить звуковые эффекты, смикшировать аудио, синхронизировать аудио с видео, создавать собственные лупы и сэмплы и многое другое. Sound Forge Audio Studio позволяет легко захватить звук практически из любого источника. Просто подключите микрофон или инструмент к звуковой карте компьютера и нажмите кнопку Запись. Вы также можете импортировать аудио CD и MP3 или использовать функцию "Виниловые записи и восстановление" для оцифровки вашего винила, кассет и других аналоговых источников. • Неограниченное количество Undo / Redo. In Version 12.5, the core competencies of SOUND FORGE Audio Studio as an audio editor and recording program have been improved. In addition to the Real Time Monitoring, the recording dialog has been expanded with helpful functions such as lossless recording of the audio output, ideal for recording PC sound. In addition, you will also benefit from an optimized user interface with more contrast, new dialogs such as statistics and tempo dialogs, and many additional workflow improvements. Customer feedback has always been at the forefront of SOUND FORGE development. Many new features and functions are the result of our user’s feedback and wishes. The latest version is available as a 64-bit version as well as a 32-bit version and is available in many additional languages including Spanish, Portuguese and Japanese. Additionally, metadata dialog and information display in the status bar has also been re-designed to our user’s wishes. The non-destructive editing enables a faster and more flexible editing experience. Enables you to continue to tweak your edit even after you’ve made your cut. Visually identify frequencies of an offending noise, such as a chair squeak or cough, in your recording. Then use the spectral cleaning tools to select and remove the frequencies that make up the offending sounds. Spectral Cleaning intelligently recognizes missing program-material after the edit and automatically integrates material from the surrounding area to create a smooth and flawless edit. The new repair and restoration tools target specific audio problems and offer easy ways to make things right. Redesigned meters give you accurate, real-time feedback on audio levels. The new Visualization window presents several views to analyze and track audio output including Peak Meter, Oscilloscope, Phase Oscilloscope, Correlation Meter, Direction Meter, Spectroscope, Spectrogram, Bit Meter and Tuner. Customize and save the layout of the Visualization Window to suit your personal workflow.